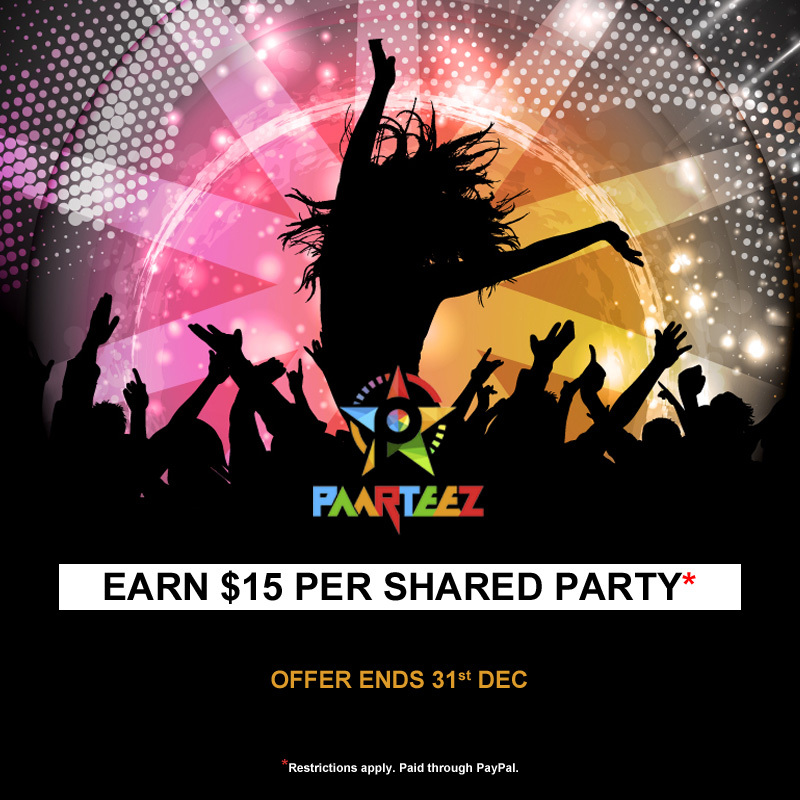 Paarteez.com is giving away $15 for each shared and published party paid through PayPal with no limit to number of parties you can share for a limited time. No purchase is necessary to participate. This offer is available to anyone, professional and individual alike, residing in US or outside, who has hosted a party and is willing to share the details. Sign up or login at Paarteez.com and add your real parties with all the details by going to Add Party. Send an email to support@paarteez.com with the parties you have added to claim your earnings. You can add, as many of your parties as you wish, however only verified and published parties will be eligible for the $15. Examples of parties you can add are Birthday parties, Baby shower parties, Christmas, Bridal shower, Thanksgiving, Halloween, 4th July, Easter, St. Patricks, Farewell etc. Verification of a party could be done automatically or manually. Publishing a party means that the party is visible to all users of Paarteez.com and will happen after party details are verified. Paarteez.com reserves the right to verify any and all details of any added party in a manner it deems necessary. If in the process of verification, if any additional information is needed, Paarteez.com will contact the user via email to get the information. If this requested information is not provided in a timely manner then the party will fail the verification and will not be published. Sponsored parties or tablescapes, where real guests are not invited, will not be eligible for participation. Offer ends at 11:59 PM PST on 31st December 2017. All federal, state and/or local taxes, fees, and surcharges are the sole responsibility of the user claiming the money under this offer. By adding a party, user is unconditionally agreeing to all the terms and conditions of Paarteez.com . Only verified and published parties will be eligible. Publishing a party is solely a decision of Paarteez.com and shall be final and binding in all respects. Any indication of false or made up information for any added party will be taken seriously and the user will be immediately disqualified from the current and future contests organized by Paarteez.com. Any issue with email delivery/receipt such as delays, non-receipt of emails due to delivery to other folders than main inbox etc. shall not be the responsibility of Paarteez.com. This promotion cannot be combined with any other promotion going on at Paarteez.com. For any questions, please reach out at support@paarteez.com.